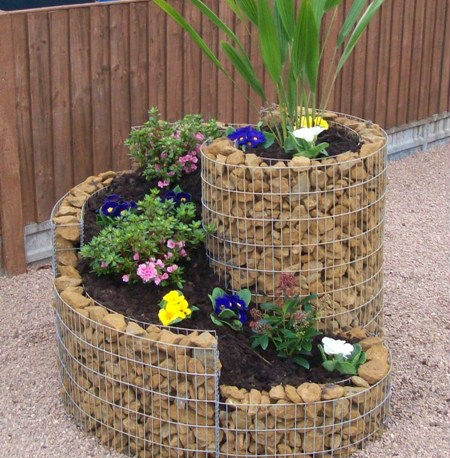 Make an unusual and beautiful flower bed for flowers onThe site can be made of metal mesh and small stones. Both materials can be bought inexpensively in construction stores, and stones can even be collected free of charge, as they are found in nature quite often (abandoned careers, sea beaches, river shallows, etc.). Fixing with a grid does not allow the stones to spread out to the sides, as is usually the case, so the flowerbed does not lose external appeal for a long time (until the grid rotates from direct contact with the ground).